The Tube Anemone burrows so only its crown is visible, and if disturbed, it will instantly retract! The Tube Anemone Cerianthus membranaceus, also known as the Tube Dwelling Anemone, has some very interesting traits. Being both colorful and hardy, it is prized for an aquarium display. This durable animal that can tolerate a fairly wide temperature range, subdued lighting, and moderate filtration. The Tube Anemone is big, however, reaching 8” (20 cm) across and its tentacles can extend 12" (30.5 cm) or more. It spreads its long outer tentacles over the surface of the mud or sand to capture prey. A good sized aquarium is necessary to accommodate its expansive size and burrowing behavior. It can also produce quite a bit of waste from the excretion of tube slime. This anemone has a long, soft, cylindrical body. The body is topped with a crown of non-retractable tentacles on one end, and a pointed foot on the other. It uses its pointed foot to burrow deep into a sandy or muddy substrate, leaving only the oral disc and tentacles exposed on the surface. Once in the substrate, the Tube Dwelling Anemone constructs a hard tube to live in. It was previously believed that these anemones created their tube by releasing a mucus, which then become covered with sand. Today however, it is known that they create the tube by releasing threads of a special type of nematocysts called 'ptychocyst'. The result is a woven fibrous structured of stinging cells that help protect it from attack. Though its tentacles are non-retractable, if it is frightened or disturbed it can instantly withdraw its whole body into the tube and become hidden. This anemone is also known as the Colored Tube Anemone because it comes in many different fluorescent hues and combinations of colors. Unlike some of the true anemones, the Tube Anemone is rarely artificially dyed or colored. Its gorgeous coloration is all natural. Be sure to provide plenty of room for tankmates to keep out of reach of the Tube Anemones stinging tentacles. In the wild, some species of burrowing sea anemones have been known to live commensally with a variety of crustaceans and worms, but in the aquarium compatibility is limited. Several Tube Anemone specimens can be kept in a large aquarium, but they are not compatible with other anemone species. Also triggerfish and large angelfish, as well as large crabs, lobsters, and snails should not be kept with them. Correct way to feed your Tube Anemone! Out of all the tube anemones, some of which are best kept in the ocean, this Tube Anemone is better suited to aquarium life. That being said, the Cerianthus membranaceus needs a deep sand bed and a long enough tank to accommodate it's ultimate size. Keep them out of reach of other corals. Tentacle colors can be fluorescent in hue and include purples, violets, oranges, blues, greens, pinks, yellows, white, brown, and various other shades of these colors. Sometimes the long tentacles are banded or striped. They luminesce to keep fish away from them at night. The Tube Anemone or Tube Dwelling Anemone Cerianthus membranaceus, is reported by SeaLifeBas to have been described by Spallanzani in 1784, and the WORMS World Registry of Marine Species reports it as being described by Gmelin in 1796. The Cerianthus genus is a member of the Cerianthidae family and contains about 20 species. The C. membranaceus is found in various locations within subtropical waters, including the Mediterranean Sea, Bay of Biscay north of Spain, then off the coast of Liberia in Africa, and Papua New Guinea. This anemone is not on the IUCN Red List for endangered species. Some other common names it is known by are the Colored Tube Anemone, Cerianthus Anemone, Giant Cerianthus of the sand, Large Mediterranean Tube Anemone, Tube Sea Anemone, Burrowing Anemone, and Burrowing Sea Anemone. Tube Anemones come in a rainbow of colors, and are found most populated in waters where the plankton is very dense. They feed on phytoplankton blooms, zooplankton, and excess detritus. If in abundance, these foods can also result in a population increases. The Tube Anemone can reach 8” (20 cm) across and the its non-retractable tentacles can extend 12" (30.5 cm) or more. It is unknown how long they live, but in the wild they may live many decades. Some tube anemone species that were introduced into the aquarium at Naples, at its inception, are now over 100 years old. The C. membranaceus has a long, cylindrical, somewhat cone-like body that does not have a foot, but a blunt point. They deflate and condense their body to drive into sand or mud. Once in the substrate they construct a very long tube. This structure is fibrous, with woven threads of stinging cells to help protect it from attack.They do not form a “ball” like other anemones do to hide, rather they retract into their “tube.” Disturbances that can cause it to retract are sudden illumination, a strong touch, and excessive feeding. The Tube Anemone has an oral disc with a crown of more than 200 tapering, non retractable tentacles, and a mouth in the center. The long delicate outer tentacles can be striped or banded and come in violets, oranges, blues, greens, pinks, yellow, browns, whites and various shades of these colors. The shorter labial tentacles located over the mouth are used to manipulate foods into its mouth and they are typically a contrasting color of the longer tentacles. The C. membranaceus takes food in and expels waste through its central cavity, or mouth. It spreads its longer tentacles over the surface of the mud or sand to capture prey. The smaller tentacles are used to manipulate foods into its mouth. Tube Anemones use their bioluminescent tentacles to startle fish, thus keeping fish from nibbling on them. The potency of the toxins in tube anemones has been shown to have little effect on test subjects, unlike true anemones, on which their toxins had lethal effects. Size of organism - inches: 8.0 inches (20.32 cm) - They can reach 8" across, with tentacles reaching up to 12". Lifespan: 100 years - It is unknown how long they live, but Tube Anemones introduced into the aquarium at Naples at its inception are now over 100 years old. Coming from temperate waters, Tube Anemones can be moderate to care for. They are best kept by intermediate to advanced aquarists as they have specific needs. This tube anemone needs a cold water environment and they require a lot of space. They need a large enough aquarium to satisfy their burrowing behavior and their ultimate size, and the temperature needs to be kept between 59 to 72° F (15 to 22°C), which that requires a chiller. Take care when selecting tankmates, as feeding is another big issue if there is any competition for the meaty foods they need to survive. Zooplankton and other marine tidbits are often consumed by fish and invertebrates before this anemone gets a chance to eat. A species specific tank or one that is very large and mature is best. When choosing a C. membranaceus, make sure the color is good, the mouth is not gaping open, and there are no tears. When being transferred from another aquarium, a healthy specimen should immediately retract, ejecting the water from its mouth. The Tube Anemone is a carnivore and will generally accept small meaty foods in captivity. It can be offered finely minced krill, fish, shrimp and/or frozen or live brine or mysis shrimp. Be careful not to feed with large pieces of food since they will damage the delicate tentacles. This anemone is nocturnal so feed nightly, or when they emerge. If you have a lot of copepods, amphipods, or other small prey in the tank, then feed twice a week. Live foods (fishes, shrimps, worms): Some of Diet - Live brine or mysis shrimp, zooplankton, copepods, amphipods and other small prey. 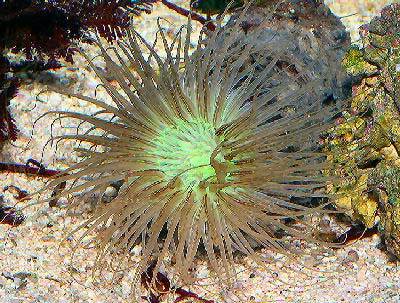 Meaty Food: All of Diet - Meaty foods must be very finely minced or they can damage the anemone's delicate tentacles. Water changes of 10% bi-monthly or 20% a month are typical. Monitor your water quality for your particular situation and adjust your water changes accordingly. Waste production created by your anemone can be calculated in inches. Basically, every inch of anemone is equal to an inch of fish, so an 8" tube anemone produces a bio-load equivalent to that of two 4" fish. The typical reef environment with a sand substrate is what is needed for your Tube Anemone, but it must be a cold water reef. It is a good idea to Invest in a chiller before you obtain one of these guys. A mature 50-gallon tank that is at least 9 to 12 months old is needed to provide a stable environment. They must have a very deep fine sand substrate, with enough depth to accommodate their total length. Hitting a bare bottom, as well as trying to burrow through course gravel (rice sized or larger), will prevent the C. membranaceus from finding a spot to burrow and settle. This can cause them to stress and die. A consistently high quality water that is well oxygenated is necessary for their survival. They don't tolerate turbulent waters, so an ozonizer is the best solution for increasing oxygen content. A good protein skimmer is a must. Live Rock Requirement: Typical Amount - A little less is fine for cold water marine tanks. Lighting Needs: Low - subdued lighting - Low, actinic lighting brings out their colors. Temperature: 59.0 to 72.0° F (15.0 to 22.2° C) - This Anemone requires temperatures below 68° F (20° C) for a few months during the winter. Water Movement: Weak - Low to moderate. Too much turbulence can cause them to get washed out of their tube, but the water does needs to be highly oxygenized. The Tube Anemone is semi-aggressive, yet as far as “anemone” type corals go, they do not have as powerful of a sting as true anemones. Care should be taken to provide other corals with plenty of room. Make sure when the North Sea Tube Anemone comes out at night, their tentacles do not come in contact with delicate corals. Several Tube Anemone specimens can be kept in an aquarium, but they are not compatible with other anemone species. Though they do coexist with their own kind, they do not get along with their “warm” water tube anemone cousins either. In the wild they have a commensal relationship with a variety of crustaceans and worm species, with these species living within their tubes. In the aquarium, you can include small hermit crabs, small shrimps, and most worms. Triggerfish and large angelfish, as well as large crabs lobsters, and snails should not be kept with them. They do not host clownfish. Shrimps, Crabs, Snails: Monitor - Do not keep large crabs in the aquarium, however small hermit crabs and small shrimps usually do fine. Starfish: Monitor - Only cold water species that are reef safe. Snails: Monitor - Do not keep large snails in the aquarium. Avoid burrowing snails that can upset their home. The C. membranaceus are hermaphrodites, meaning each specimen develops as both male and female. At a smaller size it is a male. After crossing over to a larger size/age, it will turn into a female. There is no information yet on breeding Tube Anemone in captivity. In nature, the C. membranaceus reproduce sexually with the female being larger than the male. Unlike the true anemones, they do not reproduce through asexual means such as fission, where the anemone is divided or split into parts to create a new anemone. Tube Anemones are hermaphrodites, meaning they are both male and female. Although each animal can produce both eggs and sperm, they do not produce them at the same time, so it takes two specimens to produce a zygote. The Zygote is a fertilized egg, the beginnings of a new tube anemone. There is no information yet on breeding these anemones in captivity. In the wild, reproduction takes place form January to July. First sperm is released, followed by eggs and then cross fertilization takes place in the water column. It is believed the larvae live in plankton for a quite a long time, and then settle into the sand and construct a tube. How they provide brood care is not fully known, though some species have a tentacled larval stage that extends into the planktonic phase. Tube Anemones are usually hardy and problems are pretty minimal if they are provided with an adequate environment and fed regularly. There is not a lot is known about potential ailments, these anemones seem to be either alive and very well, or dead. The Tube Anemone or Tube Dwelling Anemone C. membranaceus is easy to find in stores and online. It is moderately expensive, with price dependant on color and size.